In 711 AD, the Moors introduced a variety of artistic techniques to Europe, which included a unique way of painting ceramic tiles called ‘Zellige’ that consisted of complex geometrical forms and patterns. This artful technique was highly developed during the Marinid dynasty. During the 13th-15th century in Morocco, Zellige increasingly became a statement of sophistication and wealth, where you’ll find zellige adorning homes on floors, walls, ceilings, fountains, countertops, and often entire mosques. Maâlems (master craftsmen) have passed on the art of zellige making from generation to generation. To master these required skills, long training begins at childhood. Today Zellige is still practiced, where each tile is laboriously baked, hand cut, glazed and kiln-fired by artisans just as they were over 1,000 years ago. The cities of Meknes and Fez in Morocco still remain the centers of this art. 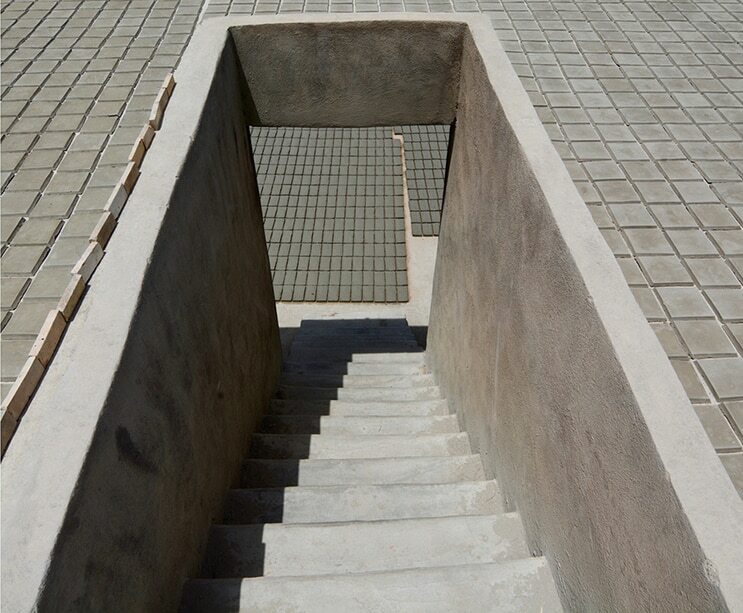 For zellige, the highest quality of clay must be used and is found in the Fez region of Morocco. 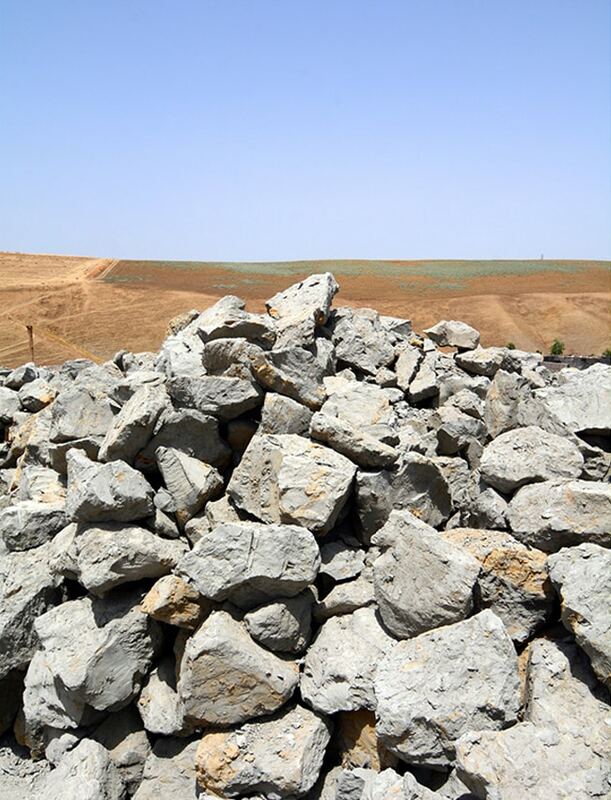 Once found, in underground mines or open pits, this clay is soaked in water until it reaches a soft texture. 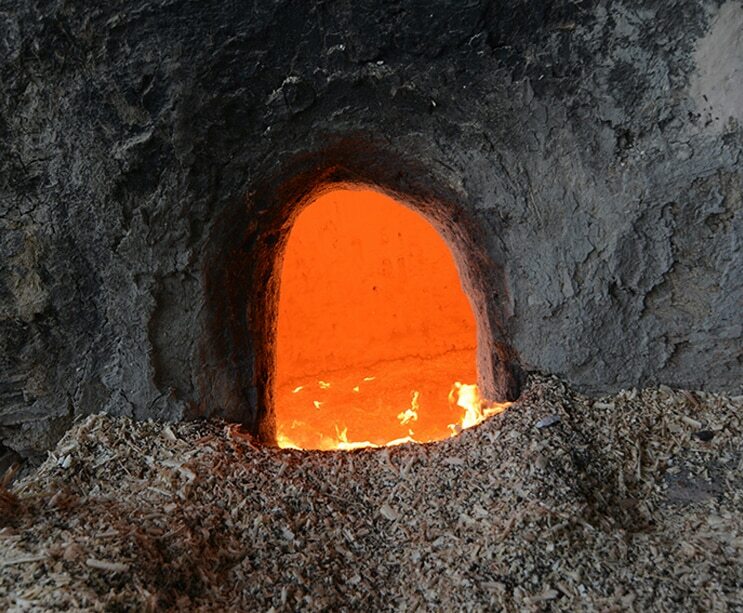 The clay is then filtered by hand to extract impurities like rocks and branches. After filtering, a skilled craftsmen flattens the clay into square shapes by hand, ensuring it is compact and with no air bubbles in it. The square raw clay tiles are then sun-dried on a rooftop. After the tiles are well dried, another skilled craftsmen applies the glaze colors by hand, one-by-one, to only one side of the tiles. 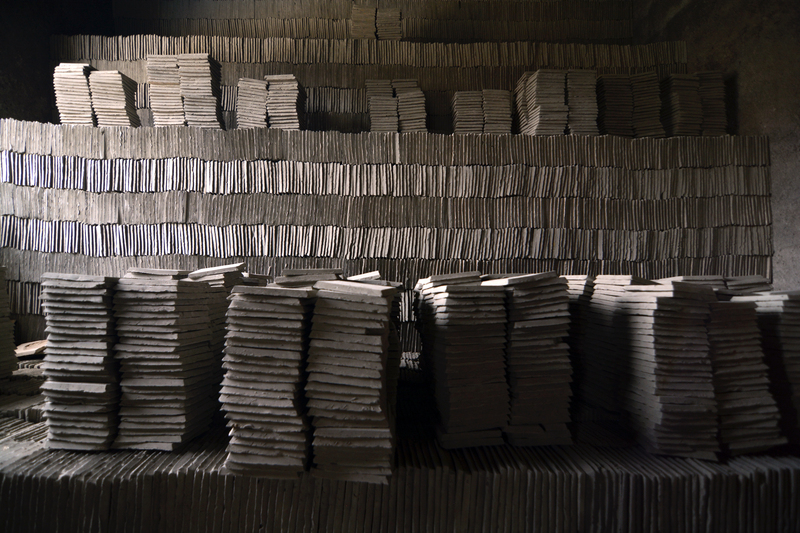 Once dried, the tiles are meticulously stacked in a natural olive-pit fired kiln. In these traditional Moroccan kilns heat circulates unevenly, imbuing each handmade tile with its own unique tone, texture, and color. 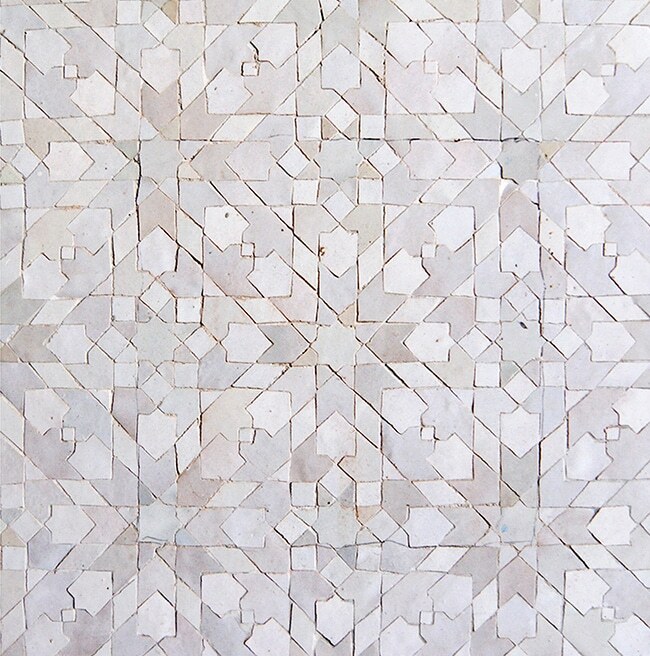 This perfect imperfection is what sets Moroccan zellige apart from every other tile on Earth. Always open several boxes at once and randomly mix zellige tiles with multiple tones and textures. Each hand-cut zellige tile is unique and contains subtle variation in both color tone and size. Crazing, pits, and small hairline cracks are common to zellige tile and are a part of their natural aesthetic. Traditional zellige tile will have approximately 15-20% of these perfect imperfections. If a more uniform look is desired, we suggest increasing the order size by 20% to reduce the amount of variation during installation. The surface should be well prepared and leveled before placing the zellige. Soak in water for 1-2 minutes to ensure tiles properly adhere to tiling surface. Evenly apply a layer of thin set to the tiling surface. Butter the back of each tile with another layer of thinset. Place tiles one by one into wall adhesive. Zellige tile can be spaced in several ways based on design preference. The traditional (and recommended) method for installation does not use grout joints; tiles are instead laid edge to edge. Zellige tiles can be easily cut as needed with a traditional tile cutter and snapped apart. A diamond disc can be used for more exact cuts and mitered edges. Wedge spacers may be needed in areas to align naturally uneven edges. Grout open, uneven edges or gaps where they appear. Once the tiles are placed, spread grout with a rubber spatula, filling all spaces and gaps between the tiles and any surface pits, chips and cracks. The preferred grout specification is Mapei Ultracolor Plus FA grout. Unglazed zellige requires MapeiFlexcolor CQ grout. The grout color should be matched as closely as possible to the color of the tile. After a brief drying, carefully remove the excess grout with a damp sponge. Polish the tiles afterward to remove any remaining grout film. All grout should be sealed after installation. Zellige is a glazed terracotta that does not need to be sealed. For Unglazed Natural Zellige ONLY we recommend using a penetrating sealer to protect the tile as unglazed terracotta is porous and absorbent. 2×6 glazed zellige are the preferred size and shape for floor installations. 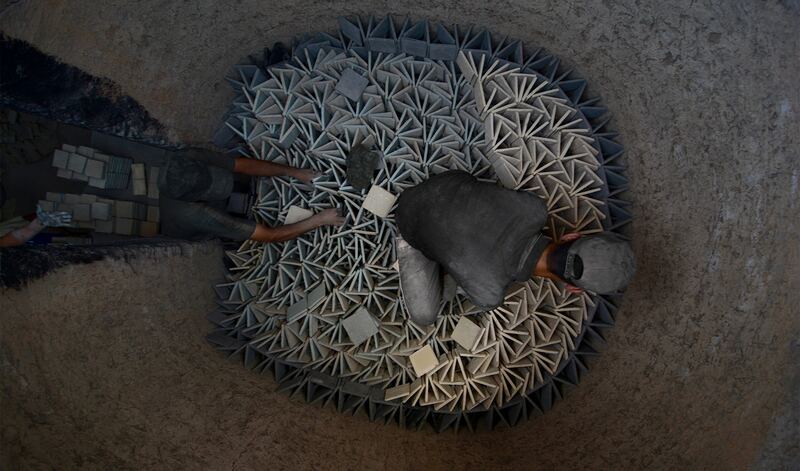 All unglazed zellige shapes can be used in floor applications due to their higher COF. Particular attention should be paid to the application of the adhesive on the floor and back of the tiles to ensure perfect bonding between the tiles and concrete slab. Zellige tiles are commonly used in pools, shower walls, fountains, spas, and bathrooms. Ensure that the surface of each area is stable and waterproof prior to starting the installation. Use adhesive cement and grout appropriate for use in wet areas. Zellige tiles are glazed and therefore do not require sealing, as they are protected from water and staining. Mix the tones and shades from different cartons to achieve harmony within the color hues and surface variations. Evenly apply flexible adhesive for ceramics on a well prepared and level surface and also on the back of the tile. For surfaces in direct contact with water - bathroom showers, pools, fountains, etc. please ensure the base surface is waterproofed before installing zellige tiles. For the 4x4” no grout line is needed (place edge to edge), but we recommend that seams, chips and pits are hand grouted with a very liquid joint cement in a neutral or matching glaze color. After drying, remove excess cement with a damp sponge & remove any remaining blemishes as soon as possible by hand. For on-going cleaning, simply use mild soap or a neutral pH cleaner.